Excellent. I would rate the Tonga Room a very close second to the Mai Kai, and I can't understand why more isn't made of it by west coast tiki folk. 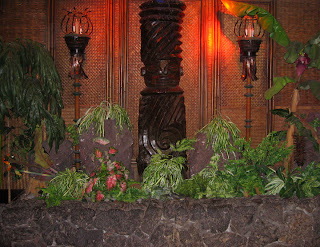 Not only is the general decor close the Mai Kai, but the rain storms every half hour and the band -- though it's neither an exotica band nor a very good band -- coming out on a boat in the middle of the pool -- this is top rank tiki escapism.